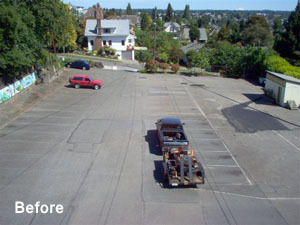 Shaw-Bel Sealcoating, Inc. has been providing professional asphalt maintenance services to the greater Seattle metropolitan area since 1994. Shaw Sealcoating was formed in 1994 by company president John Shaw after gaining extensive experience working in the asphalt industry since 1978 involving everything from large freeway paving projects to municipal street maintenance as well as residential and commercial asphalt repair. Company vice-president Ron Belaire began his asphalt career in 1982. In 2002 John Shaw and Ron Belaire joined forces after being friends and co-workers for 20 years. Shaw Sealcoating was incorporated and became Shaw-Bel Sealcoating Inc. Their combined experience working on projects involving all aspects of asphalt repair, installation and maintenance allows them to provide the customer with professional advice and options to best suit the individual project at hand. Every bid, quote and proposal originates with the motto, quality service at a reasonable price. Experience completing many commercial projects involving properties large and small allows Shaw-Bel Sealcoating Inc. to provide the customer with a plan to manage and complete each project with the least inconvenience possible. Thank you for visiting shawbel.com. 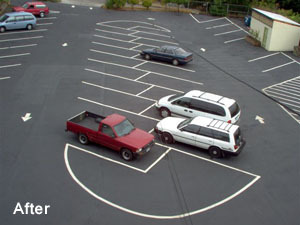 We look forward to having an opportunity to serve you on your next asphalt repair, sealing or striping project.